For Breakfast this morning I prepared a Jimmy Dean Simple Scramble Cup – Crumbled Turkey Sausage, Egg Whites, and Cheddar Cheese. I really love these. So easy to prepare and very good! Plus they are only 150 calories and 3 carbs per serving, which is excellent. The rains have finally let up, but still a lot of flooding and more heavy rain on the Saturday. After Lunch got the push broom and leaf blower out, a lot leaves and limbs around the deck and driveway. Later on I had to go to the bank and got gas. Our gas here in Ohio will be going up, They are putting a Road Tax of 18 cents on gas. They say it’s going to road repair. 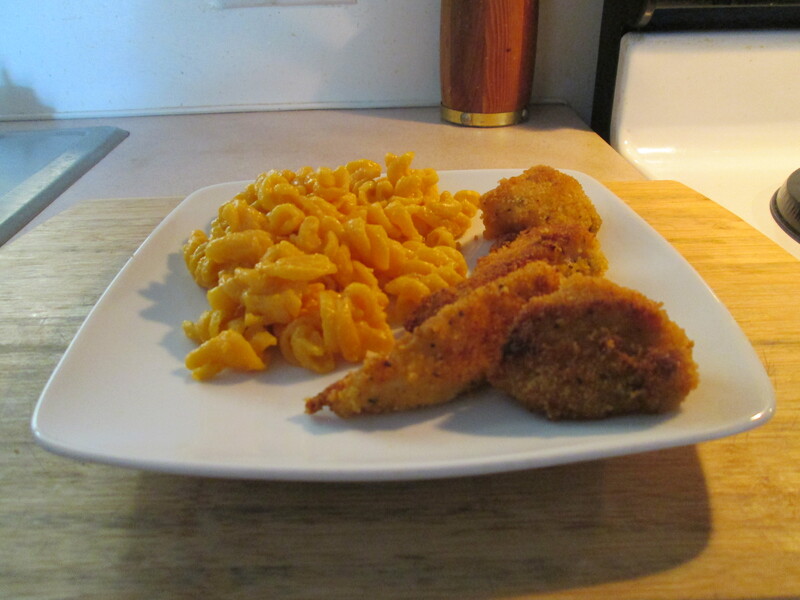 Anyway for dinner tonight I prepared Crispy Cheddar Bacon Chicken w/ Cheesy Rotini Pasta. I haven’t had this in a while and it sounded good! To make the dish I’ll need; 1 Box Betty Crocker Crispy Cheddar Bacon Chicken – Chicken Helper and 2 Perdue Perfect Portions Chicken Breasts. 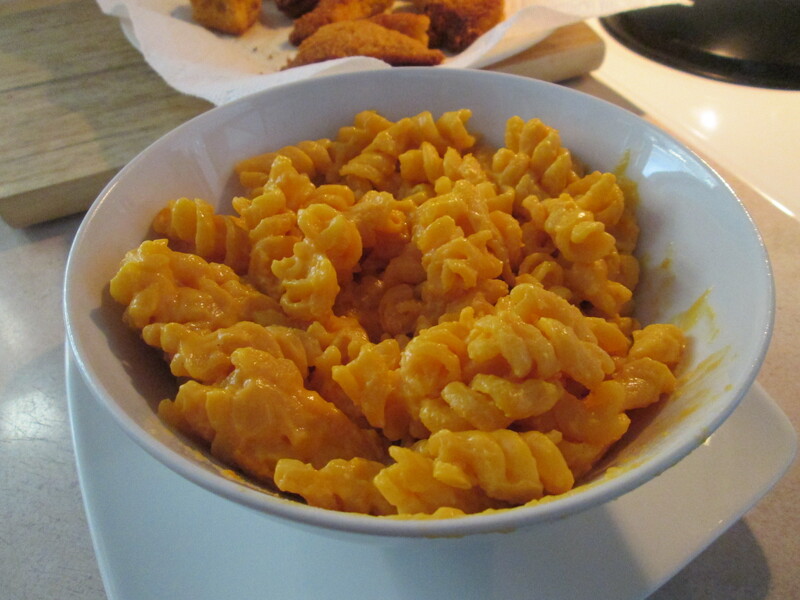 I love the Betty Crocker Crispy Cheddar Bacon Chicken – Chicken Helper. I’ve tried a few of them now but this is my favorite by far. This really turns out delicious and an easy meal to prepare! The Rotini and Cheese Sauce is excellent and the Seasoned Crumb Coating with Natural Bacon Flavor for the Chicken is one of the better Crumb Coatings I’ve had for Chicken. To prepare it first go ahead and make the Pasta, by the box directions. Just boil, stir, and season. As the Pasta was cooking I prepared the Chicken, I used Perdue Perfect Portions Chicken Breasts. I cut each Breast into 3 pieces. Coated each piece with the provided Seasoned Crumbs and fried until done. The full instructions are at the end of the post. The Chicken Helper box contains Rotini Pasta with Naturally Flavored Cheesy Sauce Mix and Seasoned Crumb Coating with Natural Bacon Flavor. I added the Chicken, Water, 2% Milk, Extra Light Olive Oil, Sea Salt and Pepper. I cut each chicken breast into 3 to 5 slices. Coated the Chicken in the Milk and Seasonings. Then fried the Chicken until Golden Brown and done. Delicious! I also baked a loaf of La Bagquetterie Garlic Oval Bread. I buy this Bread at Meijer Bakery. Good replacement for the RiverRoad bakery Bread that we no longer can find. It bakes up in 8 minutes and has nice pieces of Garlic through out the loaf. For Dessert/Snack later a bowl of Skinny Pop – Pop Corn and a Diet Sprite to drink. Finally found the Diet Sprite at Jungle Jim’s International Market. You Will Need: 1-1/2 cups water, 1/2 cup milk, 2 tbsp butter. For Chicken You Will Need: 1 lb uncooked boneless skinless chicken breasts, 1 tbsp milk, 2 tbsp butter, 2 tbsp vegetable oil. Success Tips: Start with completely thawed chicken. Adjust heat setting, cook times and amount of oil as needed. Pasta: 1 – Stir water, 1/2 cup milk, butter, sauce mix and pasta in 2-quart nonstick sauce pan. Heat just to boiling, stirring frequently. Reduce heat. Simmer uncovered about 17 minutes, stirring frequently, until pasta is tender. Meanwhile, continue with step 2. 2 – Cut each chicken breast into 3 to 5 slices, holding knife at an angle. (Slices should be about 1/2 inch thick). 3 – Coat, Place chicken in medium bowl. Add 1 tbsp milk to moisten. Add seasoned crumbs to coat chicken. 4 – Brown, Heat butter and oil in 10-inch nonstick skillet over medium heat until butter is melted. Carefully add chicken to hot butter and oil; cook 4 to 6 minutes or until golden brown. Reduce heat to medium-low. Turn chicken; cook 4 to 6 minutes longer or until golden brown and centers are no longer pink (165 degrees F). Serve with potatoes. Refrigerate leftovers. Add Your Own Twist: Stir 1/2 cup cooked broccoli or shredded cheddar cheese into the finished pasta. If you want a bit of crunch, top with 1/3 cup crushed garlic croutons! For Breakfast this morning to start my Saturday off I prepared a Skillet Potatoes and Ham for Breakfast. I used 1 package of Simply Potatoes Steakhouse Seasoned Diced Potatoes and a package of Meijer Diced Ham to prepare it. Just cook the Potatoes according to the package instructions and with about 5 minutes of cooking time left add the Diced Ham. I topped it with a sprinkle of Sargento Reduced Fat Shredded Sharp Cheddar Cheese. Sunny, hot, and humid out today. Summer like weather has returned! Got the cart out of the shed and did some yard work before it got too hot and humid out. Cleaned off the deck and driveway areas also. Then it was an afternoon of College Football. For dinner tonight Leftovers: Crispy Cheddar Bacon Chicken w/ Cheesy Rotini Pasta. Made an easy Dinner tonight, warmed up leftovers! I had the leftover Crispy Cheddar Bacon Chicken w/ Cheesy Rotini Pasta from last night. For Dessert later a Jello Sugar Free Dark Chocolate Pudding. To make the dish I’ll need; 1 Box Betty Crocker Crispy Cheddar Bacon Chicken – Chicken Helper and 2 Perdue Perfect Portions Chicken Breasts. As the Pasta was cooking I prepared the Chicken, I used Perdue Perfect Portions Chicken Breasts. I cut each Breast into 3 pieces. Coated each piece with the provided Seasoned Crumbs and fried until done. The full instructions are at the end of the post. The Chicken Helper box contains Rotini Pasta with Naturally Flavored Cheesy Sauce Mix and Seasoned Crumb Coating with Natural Bacon Flavor. I added the Chicken, Water, 2% Milk, Extra Light Olive Oil, Sea Salt and Pepper. I also baked a loaf of the RiverRoad Bake House Garlic Oval Loaf Bread. This has become the family’s favorite Baked Bread. For Dessert/Snack later a bowl of Skinny Pop – Pop Corn and a Peach Diet Snapple to drink. To start this Friday morning off I toasted a Healthy Life Multi Grain English Muffin. First time I’ve the Healthy Life Brand in a while. Kroger is the only store that carries them around here and they had not had them in stock for a couple of months. I topped it with some Smucker’s Sugar Free Blackberry Jam. I also had a cup of Bigelow Decaf Green Tea. Partly Cloudy and 85 degrees out today, more humid also. After Breakfast I headed out to Meijer for a few items and then by their Lawn and Garden. I’m looking for some Fall Mums, a bit early for the good ones to be out yet. For dinner tonight I prepared Crispy Cheddar Bacon Chicken w/ Cheesy Rotini Pasta. For Breakfast on this Sunday morning I made some Simply Potatoes Shredded Hash Browns, Heated up some Meijer Diced Ham, fried an Egg Sunnyside Up, made a cup of Bigelow Decaf Green Tea. I made a bed of the Hashbrowns in a bowl and sprinkled some Sargento Reduced Fat Sharp Cheddar Cheese. Next I put the Diced Ham over top the Hash Browns then put the Sunnyside Up Egg on to top it off. I love this Breakfast trio more and more! No McDonald’s for Mom and Dad today, I made Breakfast for them also. I prepared a couple of Poached Eggs, fried some Bob Evan’s Breakfast sausage Links, made some Hash Browns, and baked some Pillsbury Buttermilk Biscuits. Now this beats their usual McDonald’s Breakfast anytime! Mom went on to Church and stayed home and watched Dad. He’s to the point now where he can not be left alone so it’s up to us to take care of him. After Mom left I did a couple of loads of laundry. Then it was on to house cleaning, dusted and vacuumed. We have wooden flooring in the Dining Room and Hallway. So I used a dust mop on it and then a light wood floor wax. Done with cleaning inside I cleaned up outside after Lunch. Got the leaf blower out and cleaned the wooden deck and driveway areas. The leaves are all turning and falling. It’s 78 degrees and cloudy out. It looks like our last warm day, cooler weather moving in with rain tomorrow. Anyway everything all done and just relaxed for the rest of the afternoon. For dinner tonight t was leftovers, reheated the I Crispy Cheddar Bacon Chicken w/ Cheesy Rotini Pasta. As always when I make this dish, it’s leftovers the next day. This so good there’s no way I’ll let the leftovers go to waste! Below I’ve left the original post from yesterday, for description and instructions on how to prepare it. See you tomorrow! It all comes together for one easily made and delicious dinner. I also baked a loaf of La Brea Multi Grain Bread. For Dessert later a Weight Watcher’s Cookies and Cream Ice Cream Bar. For Breakfast I toasted a couple of slices of Aunt Millie’s Light Whole Grain Bread. fried 2 Jennie – O Turkey Breakfast Sausage Links, prepared a packet of the Pioneer Peppered White Gravy, and finally made my the morning cup of Bigelow Decaf Green Tea. After I had Breakfast I went to McDonald’s to pick up Breakfast for Mom and Dad. Did a few things around the house and cleaned up outside. Done for the day! Partly cloudy and a high of 77 degrees out. With everything done for the day I kicked back and watched some programs I had recorded and some College Football. For dinner tonight I prepared Crispy Cheddar Bacon Chicken w/ Cheesy Rotini Pasta. It all comes together for one easily made and delicious dinner. I also baked a loaf of La Brea Multi Grain Bread. For Dessert/Snack later a bowl of Skinny Pop – Pop Corn and Diet Peach Snapple to drink. Woke up hungry so I wanted a good Breakfast. So I prepared; toasted a slice of Aunt Millie’s Light Whole Grain Bread (lightly buttered), made some Hash Browns using Simply Potatoes Shredded Hash Browns, and finally fried up some Gliers’s Turkey Goetta! Also had the morning cup of Bigelow Decaf Green Tea. I love that Turkey Goetta! Same old with our weather. Hot, humid , and rain on and off. After Breakfast I went Kroger for a few items for Mom and then stopped by McDonald’s to pick up Breakfast for them. After Lunch I went to the hospital to see a friend of mine, he’s waiting to have heart surgery. He’s got a couple of blockages that have clean out. Back home just did a few things around the house. For dinner tonight I prepared Crispy Cheddar Bacon Chicken w/ Cheesy Rotini Pasta. I’ve always enjoyed the Betty Crocker Crispy Cheddar Bacon Chicken – Chicken Helper. I’ve tried a few of them now but this is my favorite by far. But like most items as it seems I can’t find it anywhere in my are so I have to order it online. Anyway this really turns out delicious and an easy meal to prepare! The Rotini and Cheese Sauce is excellent and the Seasoned Crumb Coating with Natural Bacon Flavor for the Chicken is one of the better Crumb Coatings I’ve had for Chicken. To prepare it first go ahead and make the Pasta, by the box directions. Just boil, stir, and season. It all comes together for one easily made and delicious dinner. I also baked a loaf of La Brea Multi Grain Bread and a Diet Peach Snapple to drink. For dessert later a Weight Watcher’s Cookies and Cream Ice Cream Bar. So for Breakfast I toasted a slice of Healthy Life Whole Grain Bread (lightly buttered), made an Egg White Cheese Omelet using Egg Beater’s Egg Whites and Sargento Reduced Fat Shredded Sharp Cheddar Cheese, and finally fried up some Gliers’s Turkey Goetta! I also had topped the Omelet with Old El Paso Smokey Chipotle Taco Sauce, which is good on anything. Also had the morning cup of Bigelow Decaf Green Tea.Mid 80’s out today and low humidity still! Got the cart out of the shed and took a spin around the neighborhood and down by the lake. For dinner tonight it’s Leftovers,reheated the Crispy Cheddar Bacon Chicken w/ Cheesy Rotini Pasta Leftover fromlast night. Yesterday’s Dinner was good, there was no way those leftovers were going to waste! The Seasoned Crumb Coating with Natural Bacon Flavor for the Chicken is the best breading for Chicken I’ve eve had. I’m going to have to find the recipe for it. I also had a slice of Healthy Life Whole Grain Bread. Below I’ve left last night’s post which includes the recipe, Enjoy! I’ve always enjoyed Hamburger Helpers – Betty Crocker Crispy Cheddar Bacon Chicken – Chicken Helper. I’ve tried a few of them now but this is my favorite by far. This really turns out delicious and an easy meal to prepare! The Rotini and Cheese Sauce is excellent and the Seasoned Crumb Coating with Natural Bacon Flavor for the Chicken is one of the better Crumb Coatings I’ve had for Chicken. To prepare it first go ahead and make the Pasta, by the box directions. Then prepare your Chicken, I used Perdue Perfect Portions Chicken Breasts. I cut each Breast into 3 pieces. Coated each piece with the provided Seasoned Crumbs and fried until done. The full instructions are at the end of the post. The Chicken Helper box contains Rotini Pasta with Naturally Flavored Cheesy Sauce Mix and Seasoned Crumb Coating with Natural Bacon Flavor. I added the Chicken, Water, 2% Milk, Extra Virgin Olive Oil, Sea Salt and Pepper. It all comes together for one easily made and delicious dinner. I also had a slice of Health Life Whole Grain Bread (lightly buttered) and a Diet Dr. Pepper to drink. For dessert later a Weight Watcher’s Cookies and Cream Ice Cream Bar. Woke up starving this morning! So for Breakfast I toasted a slice of Healthy Life Whole Grain Bread (lightly buttered), made some Hash Browns using Simply Potatoes Hash Browns, and finally fried up some Gliers’s Turkey Goetta! Oh, Breakfast is served! Also had the morning cup of Bigelow Decaf Green Tea. I love Goetta, got to start having it more often! High 80’s out today but less humidity! Finally that high humidity has let up, at least for one day or so! Got the cart out of the shed and did some work around the yard. That all done, I took a spin around the neighborhood and down by the lake. It is hot but low humidity! For dinner tonight I prepared Crispy Cheddar Bacon Chicken w/ Cheesy Rotini Pasta. Started the off with a Fried Bologna and Cheese Sandwich, and it hit the spot! I used Kahn’s Deluxe Bologna, Sargento Ultra Thin Colby Longhorn Cheese, and a Healthy Life Whole Grain English Muffin. Also had a cup of Bigelow Decaf Green Tea. Just did the usual, after I had my morning workout got the leaf blower out and cleaned up around the house and the driveway. We have a patch of woods lining the backyard and leaves constantly build up. Then came back in and vacuumed the house and dusted. We have a family member that’s a slob, a real slob. 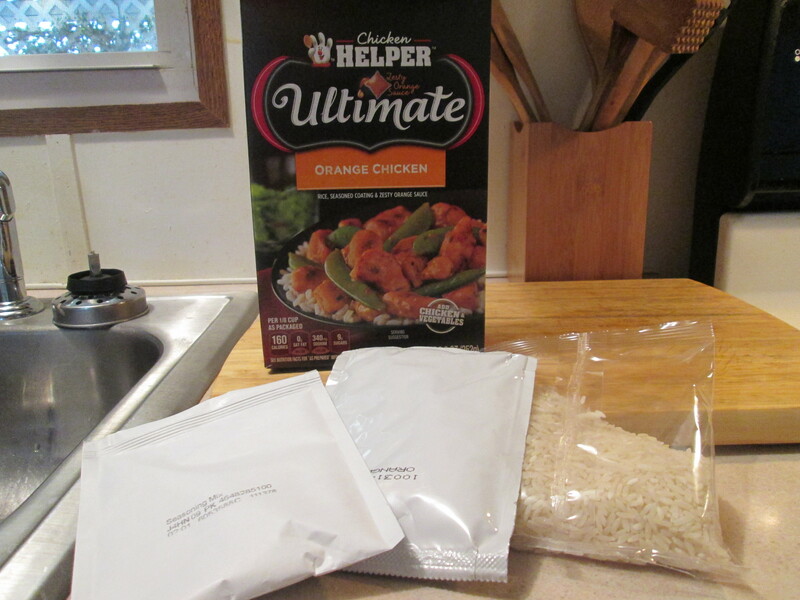 Anyway for dinner tonight tried something new, Chicken Helper Ultimate Orange Chicken. 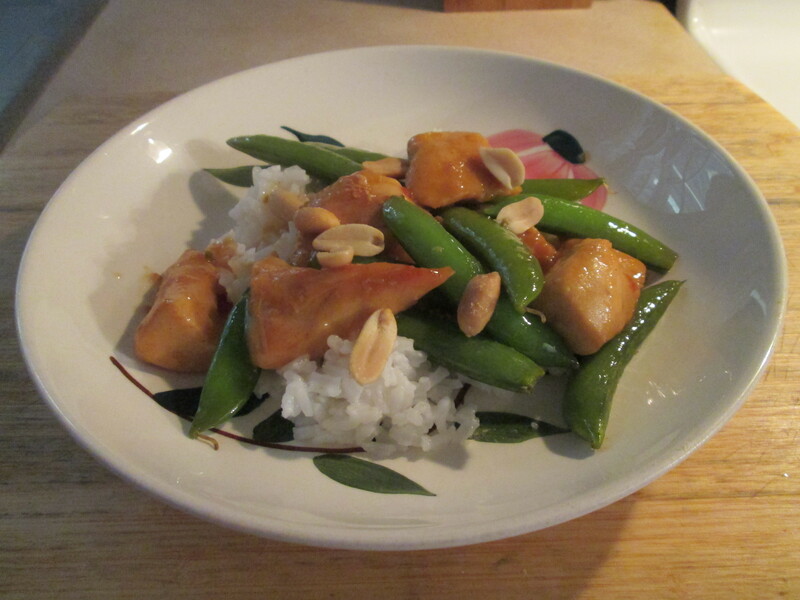 So tonight it’s Orange Chicken w/ Rice and Sugar Snap Peas. Love these Chicken Helpers! They have a nice selection of them and easy to prepare. First time I used the Chicken Helper Ultimate Orange Chicken. The box contains the Rice, Seasoned Chicken Coating, and Zesty Orange Sauce. I added the Water, Extra Virgin Olive Oil, Chicken (Perdue Perfect Portions Chicken Breasts), Sugar Snap Peas, and Peanuts. To prepare it; Pour Rice into 2-quart saucepan; add 1-3/4 cups water. Heat just to boiling. Reduce heat to medium- low to low. Cover; simmer about 20 minutes, without stirring, until Rice is tender and liquid is absorbed. And as that’s going on I cut Chicken into 1/2-inch pieces; pat dry if necessary. Placed the chicken in medium bowl. Added the seasoned Coating; tossed to coat. Heat oil in 10-inch nonstick skillet over medium-high heat. Carefully add the Chicken to hot oil; cook about 5 minutes, stirring occasionally, until deep golden brown on all sides. Simmer; Reduce heat to medium-low. Carefully pour 1/2 cup water into skillet; stir in Orange Sauce. Simmer uncovered about 5 minutes until Sauce thickens and Chicken is no longer pink in center. Also as I turned the heat down I added some Sugar Snap Peas to the mix. Serve with Rice and top with Sea Salted Peanuts. The dish turned out delicious! 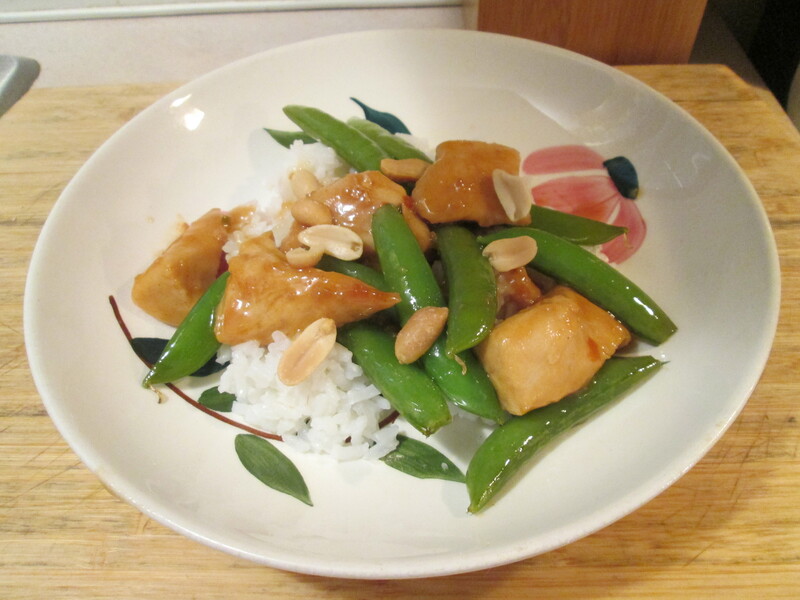 Fantastic flavoring to the dish throughout, Chicken; nice crust from the coating and moist and flavorful, the added Sugar Snap Peas and Peanuts added the perfect final touches! Mom and Dad really enjoyed this. For dessert later a SO Delicious Vanilla Dairy Free Mini Sandwiches. Ultimate satisfaction! 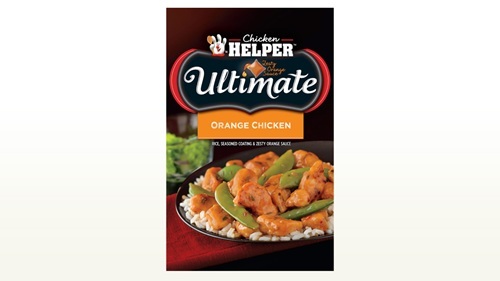 Betty Crocker Ultimate Orange Chicken Chicken Helper comes with a delicious sauce that lets you swirl in lots of rich and hearty flavor. The result? A thicker, flavorful experience that satisfies like homemade. Directions: Stir in 1-1/2 cups frozen sugar snap peas during last 5 minutes of simmer time. Top with 1/2 cup honey-roasted peanuts for some crunch. You Will Need: 1-3/4 cups water for rice. 1 lb uncooked boneless skinless chicken breasts. 2 tbsp vegetable oil. 1/2 cup water for sauce. 2. Cut: Cut chicken into 1/2-inch pieces; pat dry if necessary. Place chicken in medium bowl. Add seasoned coating; toss to coat. 3. Brown: Heat oil in 10-inch nonstick skillet over medium-high heat. Carefully add chicken to hot oil; cook about 5 minutes, stirring occasionally, until deep golden brown on all sides. 4. Simmer: Reduce heat to medium-low. Carefully pour 1/2 cup water into skillet; stir in Orange Sauce. Simmer uncovered about 3 minutes until sauce thickens and chicken is no longer pink in center. Serve with rice. Refrigerate leftovers. No rain and lots of sunshine, a beautiful Spring Day! Breakfast and my workout, then outside! Well the “Freezer Meal Week” is over but I’m going to continue using freezer products until it gets somewhat less full. Plus it saves money on the grocery bill by using what I have. So tonight I’m using Perdue Perfect Portions Chicken Breasts, took 2 the Chicken Breasts out of the package and let them thaw overnight in the fridge. Dinner tonight it’s, Crispy Cheddar Bacon Chicken w/ Cheesy Rotini Pasta. 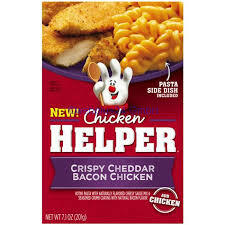 I’ve always enjoyed Hamburger Helpers – Betty Crocker Crispy Cheddar Bacon Chicken – Chicken Helper. I’ve tried a few of them now but this is my favorite by far. This really turns out delicious and easy meal to prepare! The Rotini and Cheese Sauce is excellent and the Seasoned Crumb Coating with Natural Bacon Flavor for the Chicken is one of the better Crumb Coatings I’ve had for Chicken. To prepare it first go ahead and make the Pasta, by the box directions. Then prepare your Chicken, I used Perdue Perfect Portions Chicken Breasts. I cut each Breast into 3 pieces. Coated each piece with the provided Seasoned Crumbs and fried. The full instructions are at the end of the post. The Chicken Helper box contains Rotini Pasta with Naturally Flavored Cheesy Sauce Mix & Seasoned Crumb Coating with Natural Bacon Flavor. I added the Chicken, Water, 2% Milk, Extra Virgin Olive Oil, Sea Salt and Pepper. It all comes together for one easily made and delicious dinner. I also had a slice of Klosterman Wheat Bread. For dessert later a Jello Sugar Free Dark Chocolate Pudding.